The buyer fee is a pemium charged by Regal Auctions on all sales. This expense is to cover our administration, operating and marketing expenses. 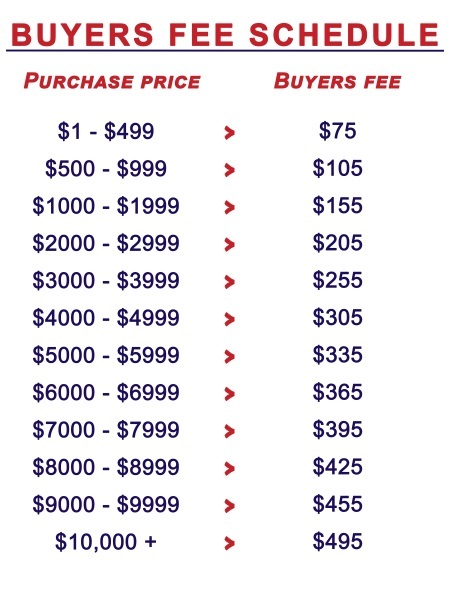 Please factor the buyer fee into your purchase price. Fleet and Repo vehicles are subject to the same buyer fee as regular consignments. Online bidders will be charged $50 for any purchase made via our online bidding platform. Slide to change the sale price. The sale price is the amount you bid at the auction. LIVEBLOCK: Check this if you will be bidding online.